Giveaway Time! 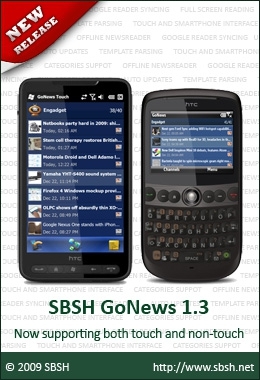 Win a Copy of SBSH GoNews 1.3! "Today, SBSH Mobile Software updated its best selling newsreader application GoNews to version 1.3, adding support for Windows Mobile Smartphones (non touch screen devices) for the first time! GoNews 1.3 is the first version to support both Windows Mobile Touch and Non-Touch screen devices! Furthermore, GoNews 1.3 brings great download speed improvements, design improvements and some great new features for both Windows Mobile Touch and Non-Touch users. We invite all our users to update to the latest and greatest GoNews version!" You didn't think we'd stop at just PhoneWeaver, did you? Yes, thanks to SBSH, we're hosting another holiday season giveaway! This time, we have five copies of GoNews 1.3 up for grabs, and this latest version packs a punch. It offers faster updates, touch and non-touch optimizations, and of course, long-awaited support for Windows Mobile Standard (that's Smartphone in the old tongue). So what do you have to do to win? Read on and get commenting. Good luck! Leave a comment in this thread, stating your favourite news source. Perhaps it's CNN, BBC, The NY Times, The Australian, or even yours truly - Windows Phone Thoughts. Entries will be accepted until 11:59 PM GMT on January 10, 2010. A total of five winners will be selected randomly and notified via e-mail, so please ensure that a valid e-mail address is linked to your Thoughts Media account. Each winner will receive a single licensed copy of GoNews 1.3. My favorite news source is The NY Times, although I usually get to it via Google News. I use cnn.com as my main source of news. My general news comes from cnn.com but the really good stuff comes from Windows Phone Thoughts. For Pocket PC/Windows Phone news Windows Phone Thoughts has been my choice for nearly 8 years. Does that count as two entries? I think the BBC provides the most untainted world news.